Independence Day (July 4th) is an important American holiday in July. Celebrating this holiday goes hand in hand with posting American Flags in front of our homes. Show your patriotic pride and come by Argyle Feed Store and choose from our stock of flags. There are many types of flags available. There are the flag poles, outdoor banners, sticks and indoor flagpoles. The wall mounted flag is a popular one. Make sure to contact the store or stop by and ask us about how to mount your flag. 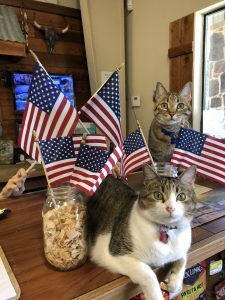 Get your American Flags in time for Independence Day on Wednesday, July 4, 2018. This entry was posted on Friday, June 22nd, 2018 at 11:17 am	and is filed under News & Updates. You can follow any responses to this entry through the RSS 2.0 feed. Both comments and pings are currently closed.